It’s not just crazy cat ladies who appreciate the Kitty Glitter pokie from IGT, as this game is one of the most popular in their range. Cute moggies fill the reels along with the standard playing card symbols, but there’s a sprinkling of diamonds thrown into the mix and these precious jewels are the key to an exciting free spins game where extra wilds can appear for more wins. Beautifully designed, in a typical IGT style, the realistic pictures of our feline friends should make this pokie fit for purrpose, as it comes with an assurance of fair play and a generous return to player ratio. It’s already been a big hit at land based and online casinos alike, so let’s take a look and see what the appeal is. Cats and diamonds combine to give this game an appropriate name and the glitter theme even continues to behind the reels, where a bright red background filled with sparkling lights makes it look like Christmas all year round. There’s a total of 5 reels, where the symbols are arranged in 3 rows and running left to right, there’s 30 paylines although players have the option to activate any number of them if they want to try it out for just a tiny bet. The options go from just 0.01, or 0.30 to activate the whole game, up to 10.00 per spin, with an autoplay function that can set the game off for up to 100 spins without needing any further input from the player. They will need to see 3, 4 or 5 of the same symbol type running across an active payline from the left side to win anything, although the scatter symbol will pay in any positions. Lower value wins are created by the playing card symbols 10, J, Q, K and A, each of which has a little sparkle on it, while the cute cats are responsible for bringing in the bigger prizes. These well-designed critters come in a variety of shapes and colours although they all look a bit fed up to be there, which is a minor point and unlikely to ruin anyone’s enjoyment of the game. It’s all very nice spinning up wins by lining up these standard symbols, but the real appeal of Kitty Glitter isn’t the cats, it’s the bonus features like free spins and wilds. The wild symbol is the Kitty Glitter logo which will substitute for any of the playing cards or cats to help complete winning combinations, or will also stretch lines further across the reels for a bigger prize. Diamonds are a cat’s best friend however, as any 3 or more appearing in any positions on the reels will trigger 15 free spins. As well as this, players win 3x their stake before the spins commence, so even in the unlikely event that they don’t win anything in the bonus games, they won’t come away empty handed. There’s some nice extra features in play during these spins, as each time a diamond appears on the right side reel it will fill up an accumulator below the game. This shows the 4 cat symbols and the more diamonds collected, the more of these cats turn into additional wild symbols for any remaining spins. If anything between 3 and 5 diamonds are seen, the Persian cat will be an extra wild on reels 2 and 5, while spinning up 6, 7 or 8 diamonds will also turn the tabby cat into a further wild symbol. Anyone who manages to collect 9, 10 or 11 diamonds before the end of the 15 free spins will have the Calico cat joining the others as a further wild and if a total of 12 diamonds appear on the right-side reel during the free spins, the Siamese cat will become yet another wild. It’s easy to see that as the round progresses, it gets easier and easier for wild substitutions to complete more and more winning lines. 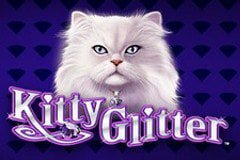 Cat lovers and those players who really are not keen on them at all, should all agree that Kitty Glitter is a pokie with the potential for some nice returns. Standard gameplay might be a little uninspiring, but once the free spins begin, there’s plenty of excitement watching the diamonds accumulate in the meter and seeing all those extra wild symbols added to the reels. Having all the cats acting as wild symbols by getting 12 diamonds turning up on reel 5 before the end of the round is a little tricky, but as the scatter symbol can re-trigger the games over and over, players who get a further 15 or more spins should find that these games pay out multiple times.